Yesterday, I had the pleasure of watching the first match from the GLO Premier League 2012-2013. 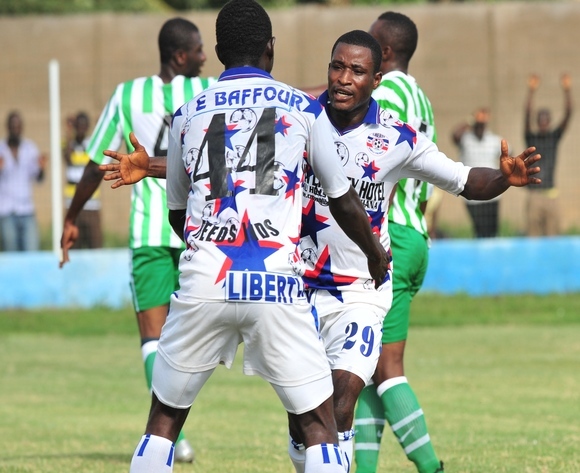 Liberty Professionals FC welcomed King Faisal Babes, the newly promoted team from Kumasi. Liberty Professionals FC took the lead after 13 minutes when Kennedy Ashia made a smart and well-placed finish from about 16 meters. Prince Boateng equalized after 71 minutes with a free header. The game was rather poor, with several missed passes and few chances. In Daniel Agyei (born 10.11.1989), Liberty Professionals FC has a wonderful goalkeeper. The current season is actually Agyei’s sixth season at the club. Agyei is the captain of Liberty Professionals FC and is a confident and athletic goalkeeper with experience from the Ghana U-20 national football team. Emmanuel Adjetey (born 15.12.1988), a new signing from second level side International Allies FC, played at left-back. Adjetey has top level experience from AshantiGold SC. Atta Kusi (born 25.10.1992) played at right-back. I have always liked Atta Kusi, primarily because of his willingness to join the attack. The central defensive pair consisted of strongman David Addo (born 07.09.1982) and Tuffour Frimpong, while Prince Gyimah seemed to play as a holding midfielder, shielding the central defenders. Liberty Professionals FC has lost their playmaker Michael Helegbe to Asante Kotoko FC. Kennedy Ashia could very well be the perfect replacement. Ashia orchestrated several moves from the central midfield position and showed what an intelligent player he is. Ashia was partnered by the hard-working James Kotey. Kotey was substituted for Ofoe Ofotsu (born 20.12.1989). Zuberu Fuseini, Ernest Barfo (born 19.09.1992) and Kwame Boahen played up-front. I was impressed by the hard-working Boahen, primarily attacking from the right-wing. Barfo caught my eye due to his hard work and liveliness. Fuseini was substituted for Safiu Fatau, an interesting new signing from International Allies FC. Fatau, a pacy striker, has featured for the Ghana U-20 national football team earlier this year. Boahen was substituted for midfielder Christopher Nkansah (born 01.01.1990). Ben Mensah (born 07.08.1983) is first-choice goalkeeper at King Faisal Babes. Mensah, formerly of Great Olympics, looked rock-solid although he was rarely tested. Ransford Kwakye, a big, strong centre-back, is definitely the main man in defence. From my point of view, Kwakye was one of the best performers of the day. Mohammed Alhassan and Kwadwo Boateng were defending together with Kwakye, the latter captaining King Faisal Babes from the left side of defence. Boateng joined AshantiGold SC before the GLO Premier League 2011-2012 but failed to impress, returning to King Faisal on a loan deal during the mid-season transfer window. Joseph Akowuah seemed to play in a defensive midfield role. Ibrahim Suraj did well as a right wing-back, while Eric Boakye played at left wing-back. Farouk Mohammed is a key midfielder, mostly used in a deep-lying role, while Joshua Akoto had an attacking role, just behing the strikers of Sulley Mohammed and Wilson Andoh (born 29.11.1990). Mohammed was one of the revelations when King Faisal won promotion last season. Big things are expected from the striker, who was heavily guarded by the experienced David Addo of Liberty Professionals FC. Andoh has top level experience from Gamba All Blacks FC, Tema Youth FC, Berekum Chelsea FC and Hearts of Oak SC. Andoh was replaced by Prince Boateng, who eventually scored the equalizing goal. Boateng did well on the right side of midfield with his energetic style. Boakye was replaced by midfielder George Ekow Annan, while Farouk Mohammed was substituted for Tetteh Nortey (born 20.11.1990), signed from Hearts of Oak SC. I am pretty sure that strongman Nortey, who can play at centre-back or as a holding midfielder, will become a key player at King Faisal due to his hard tackles and ball-winning ability. After being a regular for Hearts of Oak SC during the GLO Premier League 2009-2010, Nortey was mostly a fringe player for the last two seasons. The change of scenery will most likely do him well.